The Indian state of Tamil Nadu stood out in the recent elections to the Parliament. Along with states such as West Bengal, Odisha, Kerala, the electorate of Tamil Nadu rejected the idea of Hindu Right government led by Narendra Modi. A whopping 44 per cent of the electorate voted for the All India Anna Dravida Munnetra Kazhagam (AIADMK) led by Jayalalithaa, the popular chief minister of the state. Jayalalithaa fought the elections on the plank of development, social justice and secularism. Out of the 39 Lok Sabha seats in this state, the AIADMK won 37 seats. Tamil Nadu fares far better than the state of Gujarat (which was hitherto led by Indian Prime Minister Narendra Modi) in Human Development Indices (HDI). Nobel laureate Amartya Sen and Development economist Jean Dreze have spoken/written about this. Good governance is not the single factor for the unique nature of mandate from this South Indian state which is the seventh most populous of all Indian states. What else could be the factor? The legacy of secularism in this state needs a deeper look, considering the failure of the Hindu Right Bharatiya Janata Party (BJP) to make inroads into Tamil Nadu despite cobbling up an alliance of seven parties in the build-up to the Parliament elections. The literature and history of Tamil Nadu point to the secularization of God in public spaces since time immemorial. Secularization of God happens when God is freed from religions in public discourses. Public discourses are shaped predominantly in political, academic and media spheres. C.N.Annadurai, the first non-Congress chief minister of the state rode to power using the words of the saint-writer Thirumoolar. "We are all One; God is One" are the words of this scholar-saint Thirumoolar. These words were effectively used by the Dravida Munnetra Kazhagam (DMK) led by Annadurai in public spaces to win over the support of the faithful cutting through the barriers of different religions. Since then, the ability of the people to combine syncretic tradition and the scholarship on commonality of different religions helped fight any kind of bigotry which was orchestrated with a view to divide the people. Stories of people finding common ground among their faiths abound in this land of Sangam literature (from 300 B.C to 300 A.D) which spoke of cosmopolitanism and inclusiveness over 2,000 years back. Subsequent to the Sangam literature, there was a tradition of Bhakti literature (from 6th Century A.D to 19th Century) in Tamil. Bhakti literature is large body of lyrical writings – in praise of Lord, The Almighty- by scholars of various faiths. The words of another saint-poet Thayumanavar compared all religions to rivers which confluence at the Sea that is God. Public discourses built on such a large body of literature singing the praise of God helped not just the DMK, but also its splinter group, the AIADMK led by the charismatic actor M.G.Ramachandran (popularly called MGR), Jayalalithaa’s mentor, since 1972. MGR, three-times Chief Minister of Tamil Nadu from 1977 to 1987, openly expressed his belief in God unlike other Dravidian party leaders who were secretive about visiting temples or other places of worship. The idea of God as a moral force or as one stressing among other things compassion for the fellow humans gained ground through several Tamil language feature films, which were used by the Dravidian parties as a major propaganda machine. The film Parasakthi (1952), one of the early popular Tamil films to be used as a propaganda material by the DMK, did not question the belief in God, instead it raised questions about misusing religion to deny equal opportunity for all the people. In public discourses, faith has always been a virtue and is scorned at only when it is found to be misused. When faith is used to discriminate against certain sections of people or to put down people of other faith, such practice is viewed as an act of wrongdoing. Jayalalithaa, general secretary of the AIADMK and the present Chief Minister of Tamil Nadu, never hesitated to express her faith in God publicly. Be it her visit to Chamundeeswari temple in Mysore in the state of Karnataka or her visit to Srirangam Ranganathar temple in home state, they were all spectacle for the common person. Jayalalithaa’s pre-dawn visit to the Triplicane Parthasarathy temple in Chennai was a much-publicised media event. Jayalalithaa does not stop with temples; she celebrates Christmas with Bishops and the laity of all denominations every year; she hosts Iftaar parties for the Muslims during the holy month of Ramzan each passing year. The idea of “We are all One; God is One” resonates every time she or her political arch-rival and DMK chief M.Karunanidhi celebrates Christmas with the faithful. The idea of secularizing God is nothing new as we have evidence of both literature and history vouching for this. Recently, Stephen Paul Patterson, a scholar from United States, studied the common elements of Buddhism, Christianity, Hinduism, Islam and Judaism. He found that Surrender, Forgiveness, Compassion, Justice, Unitive Seeing or Oneness of Being are the basis for all these faiths or ways of life. Interestingly, the United States has woven belief in God into its system. “In God We Trust” is all over the place. 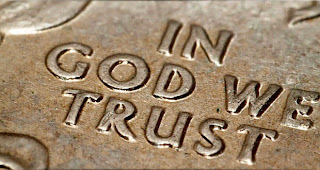 Twenty dollars, quarter dollar or five cents, these words of faith are inscribed everywhere. Indian secularism strived to do something similar; finding common ground of all existing faiths. However, the bigots across the country have resisted such efforts to unify people of all faiths historically. Dwelling further on the Indian context, in stark contrast to the state of affairs in Tamil Nadu is the northern state of Uttar Pradesh(U.P). The people of this largest state in the country (U.P) may have failed to build on the idea of freeing God from the clutches of religions. There is a rich Indian tradition of the works of weaver-poet Kabir, Basavanna and other saint-scholars who successfully liberated God from the confines of religions. It is important to secularize God (free God from religions) to achieve communal/social harmony in a multi-faith country like India. The rise of Narendra Modi to Prime Ministership of India coincided with killings of religious minorities, especially Muslims, in Uttar Pradesh and Assam as a result of hate-mongering by the Hindu Right Wing. To end bigotry in India is not an easy task at a time when it has found legitimacy through a democratically elected regime at the Centre. However, Politics is the Art of the Possible and a vibrant Opposition bloc of regional political parties and the Congress under Sonia Gandhi can help keep the idea of India alive, besides people’s movements for a plural India.